Guest posting is one of the most popular content marketing tactics because, when done right, it can help you grow your online audience. Despite its usefulness, however, many people have tried it only to get mediocre results. I’ve done several guest posts of my own. I’ve been fortunate enough to get featured on popular sites including Kissmetrics, Unbounce, and Entrepreneur. Aside from publishing on blogs in my niche, I also experimented with publishing on other platforms and targeting lesser known blogs. Some guest posts sent me over a hundred subscribers in a short amount of time, while other posts resulted in hardly any traffic at all. Some guest posts sent me ongoing traffic while other guest articles sent a blip of traffic only to fizzle shortly after it was published. 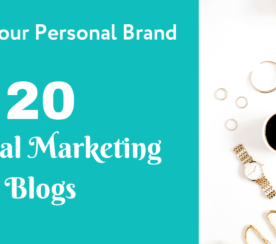 In this article, I’m going to share some insights into what made some guest posts significantly more successful than others and some tips on how you can get better results from guest blogging. When guest posting, most bloggers don’t really think about SEO too much. Guest bloggers are usually more focused on creating engaging content for the host blog’s audience or simply just getting featured. After all, it’s someone else’s blog, so why should you care about SEO? The obvious answer is that a blog post that is ranking in the search engines can get ongoing traffic, which means more ongoing exposure for your article and your business. Furthermore, a well-written guest post on a popular blog can attract natural links from that blog’s readers. And once that post ranks in the search engines, it can attract even more links from people who discover the article. Besides having a link from an authority site, the inbound links to that article will pass some link equity back to your site (as long as your bio link isn’t nofollowed). 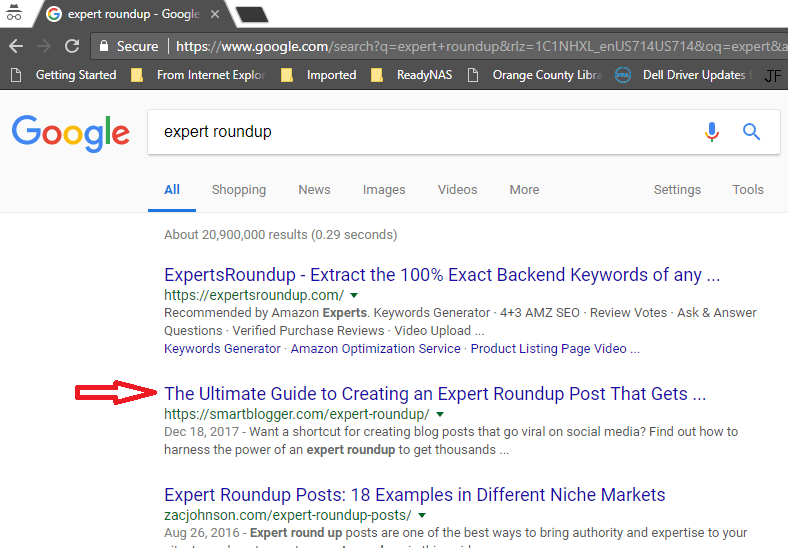 My guest post on SmartBlogger is ranking for the term “expert roundup”, which is a phrase that bloggers sometimes search for. I discussed how I was able to create a roundup that got over 5,000 social shares and some of the details that other bloggers miss, which results in most roundups getting less than 100 shares. By ensuring that the article was of higher quality than competing articles and continuing to promote it, I was able to get the article ranked on the first page of Google. This post continued to earn backlinks after it was published and sent ongoing traffic to my site, long after it was first published. Ranking for this article would have been a lot more work if I didn’t tap into SmartBlogger’s built-in audience and authority. One reason that guest blogging is so alluring is that we can tap into another blog’s already established audience. Because of the built-in exposure, most guest bloggers don’t bother to promote their guest posts too much on their own. 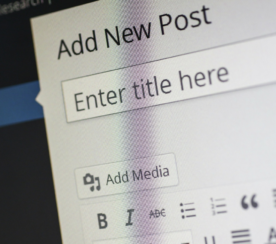 However, promoting a guest post that you wrote on an authority site can be a great way to make sure it keeps getting you exposure and sending you traffic. There are several ways you can promote old guest posts, especially ones that have performed well in the past. You can reference your old guest posts through other guest posts or articles on your own blog. 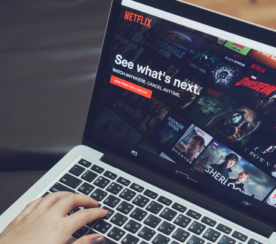 Even if the links are required to be nofollowed, referencing old posts will allow more people to find out about your content which could result in more natural links. You can also reference old guest posts if you post regularly from the same blog. In addition to helping more people discover your content, the internal links will also help with SEO. For example, I’ve written multiple articles for Search Engine Journal. Sometimes I’ll mention one of my older SEJ articles in my newer guest posts. When promoting old guest posts, try to do more than simply linking to it. Convince readers of the value of the resource so that they’ll actually be tempted to click on the link and check it out. Adding an image along with some descriptive text can be a good way to draw attention to the link. 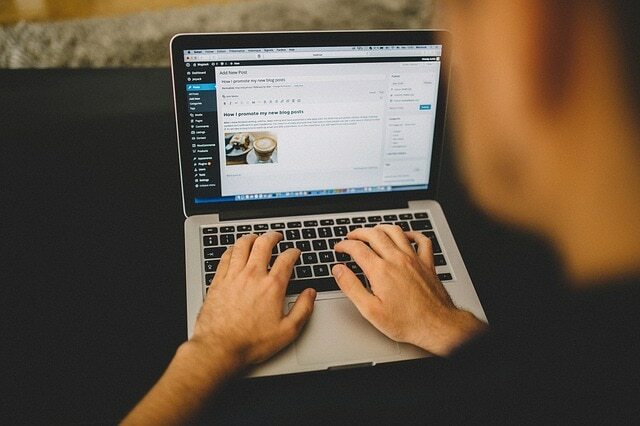 For guest blogging, most people want to get featured on top tier blogs in their niche. Getting featured on top tier blogs is great for a blogger’s credibility and perceived authority. However, sometimes second tier blogs and blogs outside of your niche can be better sources of leads and traffic. LinkedIn Pulse was a great source of leads when it first launched and some of my LinkedIn articles sent me over 100 email subscribers with very little promotion on my part. The audience on LinkedIn is more broadly targeted than the digital marketing blogs that I typically write for, but some of the people that read my articles became subscribers. On the other hand, some of the top tier blogs that I published on hardly sent me any traffic at all. On industry blogs, you are competing with lots of other experts that specialize in the same thing. When you target blogs outside of your niche, you can stand out as an expert because your peers aren’t guest posting there. You may have to experiment and try guest posting to see if a blog deliver results. But don’t rule out publishing on blogs just because they aren’t the most well-known blogs in your niche. Another thing that you should make a conscious effort to do is infuse credibility into your guest posts. Include screenshots, data, results, and anything else that will boost your credibility in the reader’s eyes. When writing a blog post, bloggers sometimes get so focused on the content that they forget to insert credibility boosters. The first time I wrote about how to do an expert roundup that goes viral was on Moz. My post was the most shared post of the week for the phrase “blog promotion”, so in this guest post, I included a screenshot of my post on BuzzSumo. Including the screenshot of my results gives me more credibility than other bloggers who are simply writing “expert roundup” guides. Most bloggers will insert credibility boosters into some of their articles, but remember to look for opportunities to add credibility statements into all of your articles. Can you find my credibility boosters in this article? If you want your guest post to have long term value, then find host blogs that promote older articles. Internal links to old articles: Internal links help with SEO and also drive new visitors to explore old content. Search Engine Journal, Blogging Wizard, and Advanced Web Ranking are a few sites that include internal links in their articles. Social media: Some blogs will schedule social shares of old articles. Check their Twitter feeds and other social media channels to see if they are sharing old content. 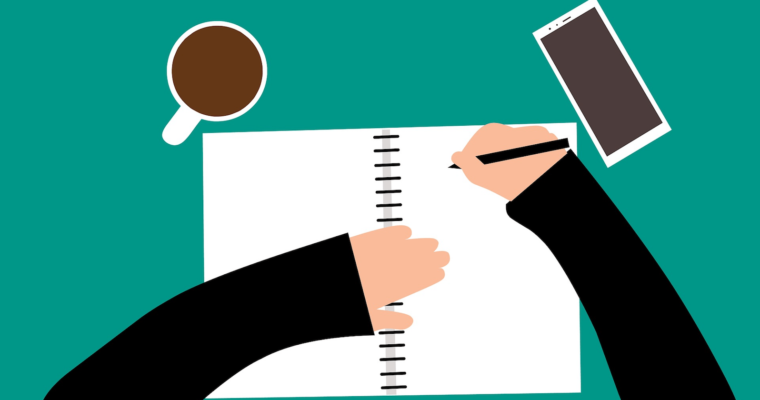 If you are publishing on a blog that promotes past guest posts, you should also pick a topic that other writers will want to reference frequently. For example, Brian Dean wrote this guide about how to do email outreach on SmartBlogger. Since email outreach is a popular blog promotion technique, that article got referenced a few times by other articles on SmartBlogger. Guest posting is a long-term strategy, so be sure to guest post consistently and approach it with a long-term mindset. Guest posting for the same blog multiple times allows you to gain repeated exposure to that blog’s audience. It takes an average of 5-7 impressions before someone remembers your brand, so you will want to guest post multiple times for the best results. Leo Widrich wrote 150 guest posts to kick start Buffer’s growth and get his first 100,000 customers. However, these results came from 9 months of intense writing. Guest blogging also might not necessarily send tons of traffic, but sometimes it’s more important to get the right kind of traffic – the kind that converts well. One important variable that can really boost your guest blogging effectiveness is creating content that stands out from the competition. However, even top influencers struggle to create content that stands out on a regular basis. So if you do create a guest post that does really well, then consider repurposing it on other blogs. I used this strategy a few times to leverage my ideas and scale my blog’s growth. One great example was my LinkedIn publishing study, which accumulated more than 4,000 social shares and became one of the most shared articles on my blog. LinkedIn had just opened up its Pulse platform to the public, but it was still in closed beta (meaning you had to apply and be accepted to contribute). Seeing how popular my article was, I also published a similar article on Mirasee’s blog, which resulted in a quick gain of more than 100 subscribers. I published another article on Blogging Wizard, which got a lot of exposure. I had to reply to comments on the post for over year after it was published. 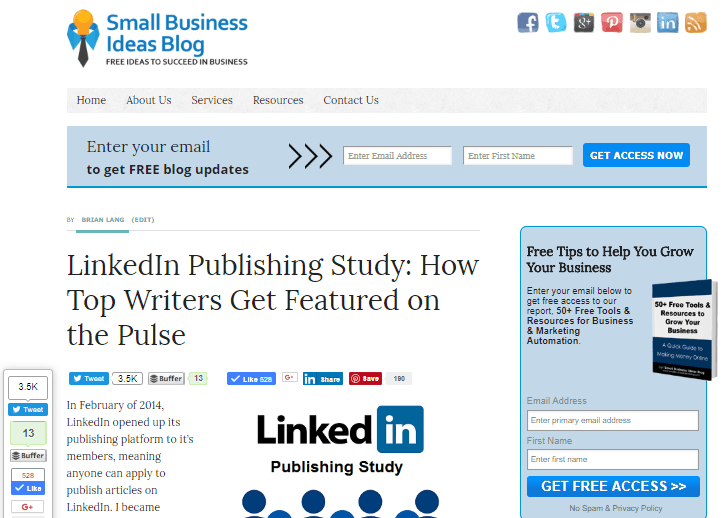 I also wrote about my experience with LinkedIn publishing on Matthew Woodward’s blog. Some other people saw my post here and asked me to guest post on their sites, including Ahrefs and WordStream. You don’t have to cover the exact same ideas in every guest post. I added additional insights that I discovered along the way to make each guest post unique. Promote your old guest posts. Experiment with writing for different blogs. Be consistent and committed to guest posting for the long term.